TJ was courteous, professional and very knowledgeable, He fixed all of my leaks. 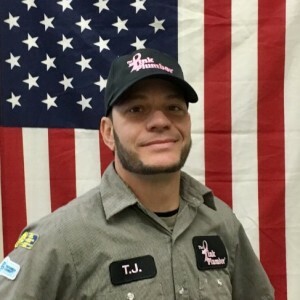 He is my new plumber now, I would highly recommend the Pink Plumber and TJ. Thomas Salvato responded to my residence on time and upon his arrival,I explained to him what had occurred and he was familiar with my problem from a prior visit. He explained to me how he could repair my issue and gave me an estimate. Upon agreeing to the service,Thomas repaired the problem in a timely fashion. His work was excellent and he was very professional during his repair. Thomas has always showed his professionalism and pride in his work. This plumber was extremely professional and highly skilled. His affect and demeanor were extraordinarily appropriate and refreshing in these troubling times. For him, it appears no job is too big or too small. I highly recommend him to any one seeking top quality service! He was very knowledgeable, and nice , professional. Pink Plumber and Richard the service technician was Fabulous! I highly recommend if you need emergency service!! Call them and ask for Richard !! Remodeled 2nd floor shower. Notice shower leaked into 1st floor ceiling. Tried to isolate leak and determined that only leaked during use of shower. Called Pink Plumber locates in Tampa, Fl and requested TJ...had him on prior plumbing work not related to shower install. Performed leak investigation and found that shower drain was the issue after cutting exploratory hole in ceiling. He replaced with new shower drain and seal and redid elbow and cross section. Ran shower after work and no more leaks. Absolutely thrilled with work by JT and always take the time to explain work upfront and competes work with professionalism and expertise. Most certainly use for all my plumbing needs. TJ was able to diagnose our problem and fix it fast. I would definitely call him again for any plumbing issues. This will be my go to plumber whenever I need any plumbing done. Great work, solved my problem and were very helpful in explaining my options. Great team! Thanks! It is so refreshing to have a service employee be so honest, professional and competent. TJ was all of these and more. He listened to my concerns and offered suggestions and answers. He arrived on time and had the installation done quickly, leaving no extra cleanup for me! Will definitely use The Pink Plumber again and will ask for TJ! Thomas was very friendly and knowledgeable. He found the leak quickly and he resolved the problem. A concrete saw had to be used to remove and replace the rusted pipe. After replacing the pipe, he did some excellent masonry work covering the hole in the exterior of the house. I would definitely recommend him. Thanks Thomas!